Over the weekend, we’ve seen a handful of reports that indicate poor LTE or Wi-FI connectivity and performance on Apple’s new handsets. The issues appear to impact Apple’s new iPhone XS and iPhone XS Max, though not all devices appear to be affected. Users who have experienced the issue report generally poorer LTE speeds, dropped reception and problems connecting to 5GHz Wi-Fi networks — especially when compared to last year’s iPhone X and 8 handsets. Because of conflicting reports, the extent and exact details of the problem are a bit confusing. The issue may be carrier-based (mostly impacting Verizon customers), and many reports hint at a software bug rather than a problem with the iPhone XS lineup’s hardware. But now, thanks to one iPhone XS Max user, there may be a short-term solution to the problem in lieu of a software patch. To be clear, this solution requires plugging the iPhone into a computer, completely wiping it of data and settings, and setting it up as a new device. 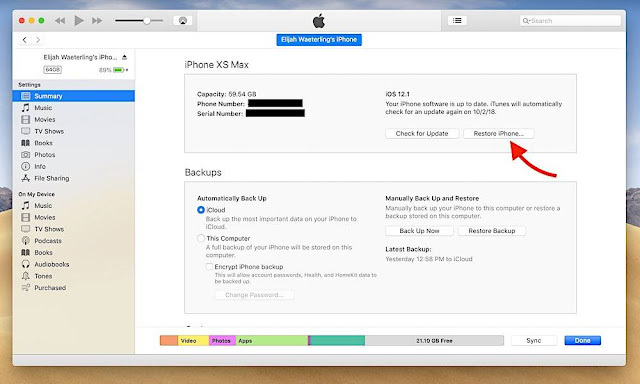 You can’t restore from an iCloud or iTunes backup. That can be fairly inconvenient. But a lot of data in iOS is stored in the cloud so this may not be a deal breaker for many iPhone users. It’s worth noting that starting with a “fresh slate” like this, so to speak, is even preferred by many iPhone owners. And if you’re experiencing significant problems with your LTE or Wi-Fi connectivity, it might be worth it. In a subsequent tweet, DrinkJuiceShelb said that it’s a “literally night and day” difference and that his iPhone XS Max is now seeing “blazing” LTE speeds. Of course, DrinkJuiceShelb’s solution also suggests that the problem may be a software bug. That bodes well for impacted users since it means that Apple could resolve the issue in a future version of iOS 12 — and affected iPhone XS owners won’t have to bring their devices in for repair or replacement.